Life is Ticking Away – Time to Smile! What is the most important thing in your life right now? 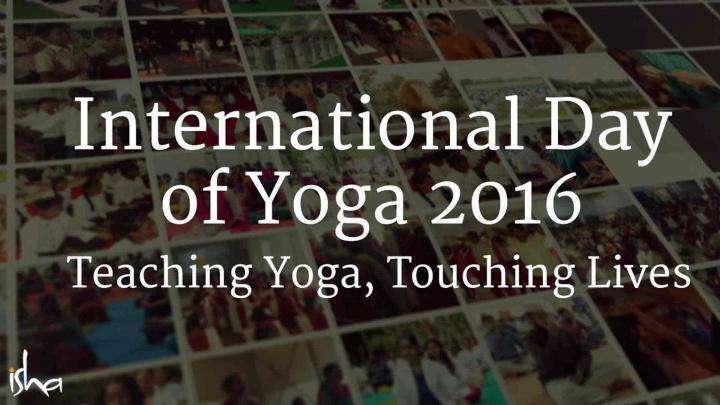 Sadhguru reminds us, only because we are alive, everything else became important. What is the most important thing in your life right now? 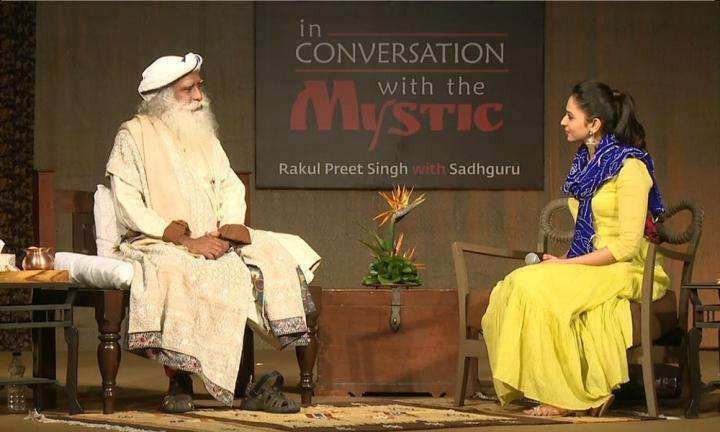 Sadhguru reminds us, only because we are alive, everything else became important. Life is constantly ticking away – but that means it’s time to smile, not frown! If we can be 100% alive every moment, then we can live joyfully and exuberantly by our own nature. What is the most important thing in your life right now? You’re alive right now, isn't it? “Sadhguru that’s okay Sadhguru but I have a bundle of thousand rupees Sadhguru, but I don’t know where to go.” That’s fine, that is also important right now. But what is the most important thing right now. You’re alive right now, isn't it so? Sadhguru: Because you’re alive, your family has become important, your money has become important, your country has become important, so many other things have become important, only because you are alive right now. And this is the most important thing, that you’re alive right now is the most important thing in your life right now. So suppose, suppose tomorrow morning you wake up… You know every day nearly a quarter million people die on the planet, natural death. Quarter million people die, but you did not. Tomorrow morning you woke up. Check, “Am I alive?” If you’re alive, will you give yourself one big smile? Sadhguru: If you are alive. If you are not, I’ll excuse you. Will you give yourself one big smile, if you’re alive? Sadhguru: And if quarter million die, at least two to three million people lost somebody who’s dear to them. So you check those three-four people who are very important in your life, all of them are alive today. One more big smile. Sadhguru: Then you check time. Its 11:30. You’re still alive. Don’t think this is a joke. What is ticking off here is not the clock, it’s your life. It is not the clock ticking away. It is your life ticking away. And it is twelve o’clock, you’re still alive. You must promise me this, every time you check time, you must give yourself a smile if you are still alive. If you are dead, you are pardoned. But so many people are walking on the street as if they are practicing their posture for their grave. Don’t worry it’ll come naturally, please. Death is super-efficient, it doesn’t need practice. When it happens… boom, hundred percent. Nobody ever died inefficiently. People live inefficiently but nobody died inefficiently. So will you promise me this, every time you check the watch you must give yourself a smile, still on, still on. You don’t know how it is happening. Do you really know? Do you know how this is happening? No. And so many people, who were so real just like you and me, pooop and they’re gone. Just gone, nowhere to be seen. If you come to the idea of mortality once in a way, it’ll make you depressed. It’ll make you fearful. If you live with it every moment, it will make you absolutely exuberant and alive. Because it is just this one thing, that this is not forever. This is just for a brief period of time. And the more joyful you are, briefer it becomes. If you are ecstatic, it’ll just vanish in no time. Yes. So if you want to stretch it, you need to make yourself truly miserable. Otherwise it will be just gone in no time. If you come to terms with this, if you live this way that every moment you appreciate one thing and only one thing because the more important thing in your life is you’re alive right now, to be alive, fully alive, one hundred percent alive is the most important thing, because only if something is hundred percent alive can you make it yield something beautiful. See you have a little plant in your life, or let’s say a mango tree in your house, it is like this (Gestures) which is just imitating you. Can you make it come out with lot of sweetness? No. It’s alive in a big way, now you can expect sweetness from that. Nobody has to teach the mango tree which is alive, please give sweetness. Anyway it will pour out, isn't it? Miserable people have be... to be taught, “Please be loving, please be nice to people, gentle to people, do this, do that.” All these things necessary because in some way you’ve become half alive. If you were exuberantly alive, it is natural for human consciousness to bleed sweetness every moment of your life. We don’t know what great things you will do or not. We don’t know whether you’ll climb Mount Everest or not. We don’t know whether you will run faster than Mr. Bolt or not. We don’t know whether you will become the richest man or woman in the world or not. But this one thing you must do to yourself, this one thing you deserve, this one thing is one-hundred percent in your hands, that you can live here as a joyful human being. This much is possible for every one of us. Our ability to fix the world around us – subject to various realities. Some things work, some things don’t work because this involves too many forces. Sometimes it falls into place, sometimes it doesn’t. But in our lives, will we do everything that we can do or not is determined by this, that only if you’re joyful by your own nature, that is, you have no fear of suffering, only when you have no fear of suffering, will you dare to walk your life full stride. Everything that you can do, you will do. In our lives, if we do not do what we cannot do, this is not an issue. But if we do not do what we can do, we are a disastrous life. It's my wish and my blessing that you should not become such a disaster. Everything that you can do must happen in this life. If that has to happen, the fundamental ambience that is needed is that you are a joyful human being by your own nature. What's the time? Still on, hmm? Let's do it! Thank you, thank you (Laughs). 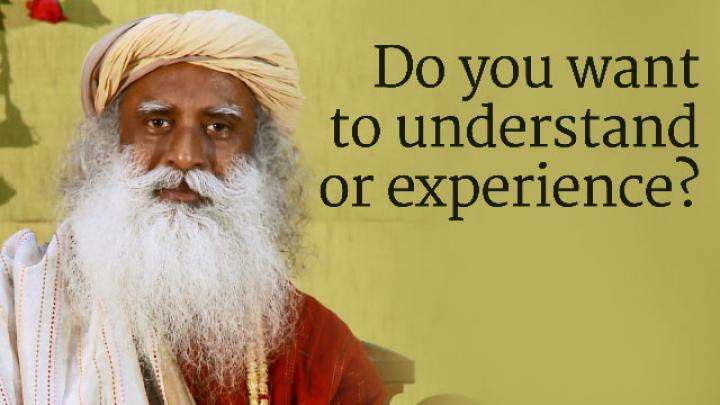 Do you want to understand or experience?